Disclaimer: The qdc Anole V6 sent to us is a sample in exchange for our honest opinion. We thank the teams at qdc and Soundwave Audio Visual for giving us this opportunity. I am actually pretty ‘stoked’ to bring you this review as this has been a long time in the making for one reason or another since I first heard the Anole V6 at CanJam Singapore 2018. Of all the monitors I heard during the event this was the one that resonated most strongly with my personal preferences. I am not sure what it is with trade shows but by the end each day I tend to enjoy musical presentations over reference. I suspect ear fatigue plays a role after so much testing. I am glad to say, 10 months on, I am getting the same ‘giddy vibe’ as I did at the show. This is a wonderful sounding monitor. The Anole V6 is not the flagship monitor in the qdc lineup. That accolade belongs to their new VX 10-BA driver monitor launched a few months ago. From what I can tell, however, the VX is also part of the Anole line-up which includes the V6 and the triple-driver V3. The price starts from $1320 for the V6 which is actually quite competitive for custom monitors of this type. qdc also have a few more product categories including the HiFi, Live, and Studio range where you will find the previously reviewed Gemini from Klaus (HiFi flagship monitor). 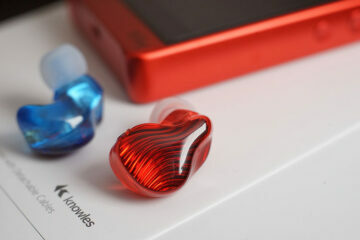 Most, if not all flagship’s in the other ranges have a max 8 drivers and use fixed tunings. 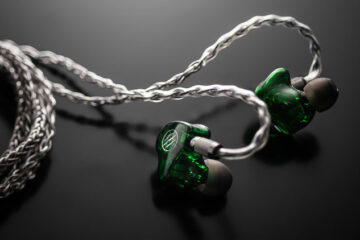 The Anole range is unique as it is their only lineup of monitors with adjustable tuning. Adjustable tuning means you can choose between four distinct sound profiles for the V3 and V6 and up to 8 for the new VX via a series of small switches on the side of each monitor. Whilst not being overtly marketed as such there does seem to be a gentle nudge for vocal lovers towards the V6 tuning which may appeal to some, certainly to me! You can also buy the V6 in both custom and universal format with the V6-C standing for custom and the V6-S (series) indicating the universal version. The universal version is also priced at $1320 whereas the V6 custom can rise in price depending on the custom options you choose. qdc do indeed have an online store and its reasonably easy to work with. However, I am quite cautious about the fact that through the entire check out process I did not see a secure SSL certificate in my browser URL. Surely this is mandatory in 2019 qdc? That being said, there are plenty of strong points with the qdc online store. Like most stores I have used the process is fairly linear but you can go back and forwards at any time in the process should you change your mind and want to tweak your final design choice. You start with your choice of the monitor of which there is currently 11 in the range which can be customized. 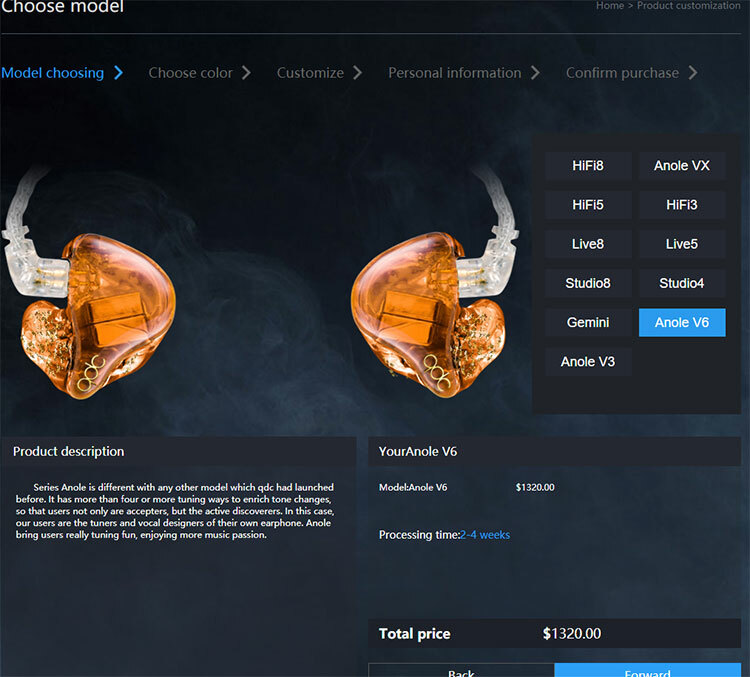 Once the V6 is chosen you have a base price of $1320 and from there you can start to add options such as color, faceplate and custom artwork which will affect the price. Once completed you will be required to register as a user and there your order will be stored from which you can reference for queries and follow-ups with qdc. What I do like is the notification of the processing time at the bottom which will reflect your order. This one is listed at 2-4 weeks which is pretty fast at 2 and average at 4. The online custom design options are very good, but in terms of what I know is genuinely possible with them, I would shy away from saying great. 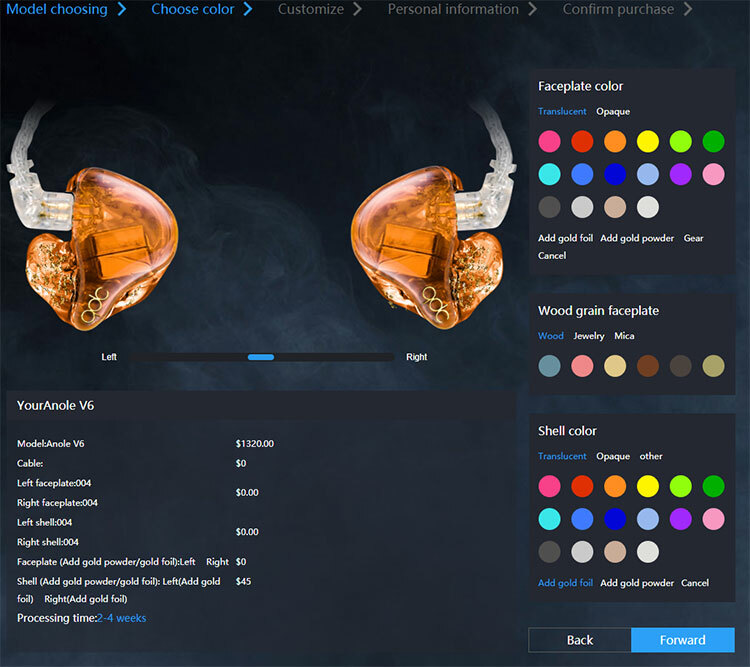 The option in our review design is called ‘Magic Color’ but it is not available in the online designer. This is an option you can request for and also in their brochure. It really should be online. Some of the titles under the options menu to the left of the design tool also require rethinking. For example, you have wood, jewelry, and mica all under the term – Woodgrain faceplate. Perhaps Premium faceplate would better work as they do come with additional fees. In total, you have 41 different faceplate colors to choose from divided into translucent and opaque. For faceplates, you have 6 wood variations, 3 skulls, 3 brooch style, and 6 mica (mineral designs). For the main shell, you have the same 41 color options as the faceplate and they are also divided between transparent and opaque. You also have the option to add gold powder or flakes for an additional fee. Beyond that, you have the option to add two types of qdc logo free of charge or upload your own custom artwork. I do have an issue though with the pricing of the custom artwork on the online tool which is an unbelievably high $360 (subject to change). Most artwork add-on fees are much lower than this on competing platforms with VE at €125 and Custom Art at just €25. Mind you, there should be enough design variations to negate the need for custom artwork but just in case you are thinking about it then it does look expensive to use. As with most online designers, you do get a break down with costs of each option so the running total is in clear sight. Be warned though, some options are relatively cheap like $30 for the gold powder, however, some of the faceplate designs start at $75 all the way up to an eye-watering $1965.00. The color icons under jewelry faceplates are monotone and not hugely indicative of what you will get until you pick it. 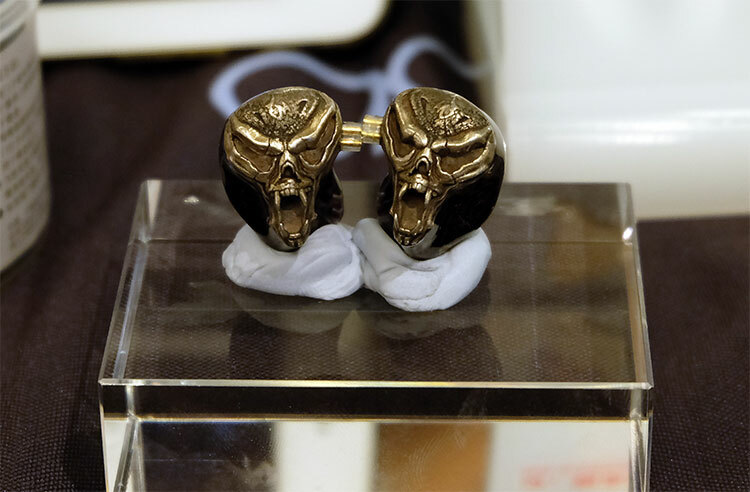 The first three under jewelry are the unbelievable skull plates which are priced at $395 additional. A big add-on fee but they look stunning in real life and may well be the best designs I have ever seen for a custom monitor. The second three are cutesier classic brooch-style designs. Striking, and unusual but these are insanely priced at $1965, more than the V6-C itself. I am told these are all hand made by a design team hence the premium price. The final set of add-ons include the cable options and I do urge you to consider this carefully for two reasons. The first is that qdc use protruding 0.78m 2 pin reversed polarity cables. This means cable rolling will be a challenge. I advise picking a good cable to get the best out of the V6 if you do not have any suitable alternative cables. The second is the price variation which ranges from $60 to $300 depending on the cable. The first two cable options are the stock 4-core silvering copper cables and are free of charge. Go for this if you have adaptors and good cables already. For everyone else, I would recommend going up to the 8-core braided cable (8c) for an additional $60 as a minimum. 8-core will deliver a much better level of dynamic range than the stock 4-core wire. I must say I am very impressed with the qdc packaging and accessory line-up. It looks thoroughly professional from the gold tinted retail packaging which slides off to a fold out black display box. 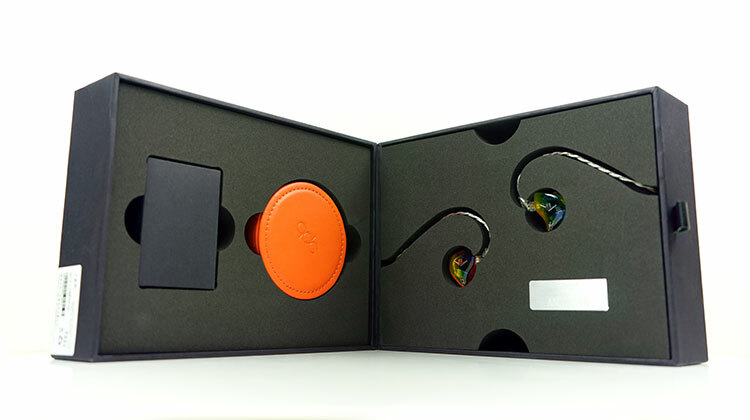 Inside you receive a leather-wrapped orange carry box, airline adapter, 6.35mm adaptor and a small envelope with a guide and warranty card. On the flip side, you get your cable and custom monitors in an attractive layout. The orange carry box is big enough to house all the accessories, monitor and possibly more than just the stock cable. I was able to fit an additional 8-wire 24.5AWG Effect Audio Janus cable inside without any real space issues. At the time of writing, qdc require physical molds to be sent into them for scanning and completion of your custom monitors. You can send them in directly or via one of their dealers such as the one we worked with, Soundwave Audio Visual. The turnaround time should be added onto their 2-4 week build time so allow for an additional week to get them to qdc. I had mine done at the HK AV Show back in August 2018 and they do require an open jaw full ear impression to the second band. Note, open jack with a flat bite block and not on its side. That means it is a fairly relaxed open jaw impression and not wide open. Around 1cm opening of the mouth will be ideal. qdc have provided a very helpful set of guides and pictures of the ideal molds to take on their website here. They also provide scan codes for We Chat customer service support should you need it. We Chat is used by almost everyone in China and is free to download on Android etc. Better for me, richer midrange.